We tend to think of a mattress as one solid thing. But the reality is that they are made up of a variety of mattress components. And the quality of each one of those mattress components has an impact on the way you sleep at night. To help you identify the best mattress possible for your budget, home, and sleep needs, we have put together a quick guide to the most important mattress components. The actual exterior of your mattress is covered in a layer usually made up of cotton or a cotton-polyester blend. This is the part of your mattress you actually cover up with your bed sheet. That doesn’t mean it’s not one of the most important mattress components. A mattress with quality ticking and stitching will typically last longer before it needs replacement. The top of your mattress contains several layers of padding. The top layer is right below where you sleep and has a big impact on how comfortable the mattress feels overall. Beneath that is another layer of padding that affects how much support the mattress gives the pressure points in your body. Finally, beneath that is another layer of padding that protects your body from the springs. In most cases, all three layers are made of a combination of cotton and foam. Under the padding is a bed of springs that provide the support for the mattress. The quality of those springs is important. In general, springs that are made from a thicker wire will be firmer and provide more support. The number of springs is also important, but more is not necessarily better. You will need to test out different innerspring mattress to find the spring configuration you find most comfortable. 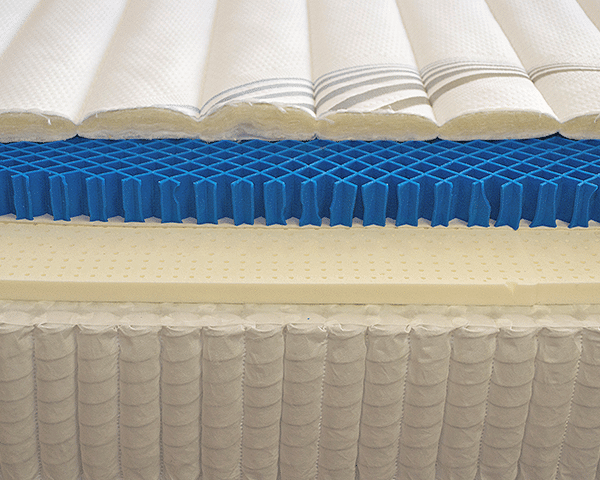 Mattresses that do not contain springs typically use foam in their support layer. There are pros and cons to selecting this type of mattress, so it’s important to carefully evaluate this option and the alternatives before making a final decision. Look for a foam mattress that is comfortable but supportive, and that helps keep you cool while you sleep. Rounding out the list of mattress components is the mattress foundation, often called the box springs. Some contemporary mattresses don’t have a foundation, but these are not common. Usually, the foundation is made of either wood or springs. Springs will give the bed a more plush feel while wood will provide more support. If you decide to go with wood, make sure the material is free of cracks and constructed straight. At Beloit Mattress, we make all of our own mattresses by hand and in-house. That means we inspect each one of the mattress components carefully and only use the highest-quality materials. There are not many mattress stores that can make that same claim. Work with us to feel truly confident about your next mattress purchase. In advance of your visit, download our free eBook to learn everything you need to know about comparing and selecting mattress options.